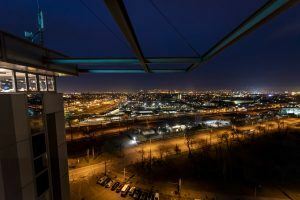 Perched on the 12th floor of the Expo Congress Hotel, the Sky Bar affords a fifty-meter-high view of the amazing skyline of Budapest! Spending your evening in this elegant bar, you can relax the day away with a heavenly cocktail or a stronger shot of liquor. Listen to pleasant background music and enjoy the Hungarian capital while you discuss your experiences at the Hungexpo with your colleagues. 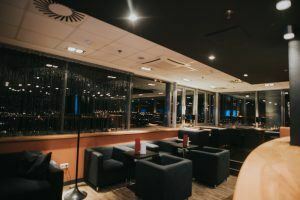 Our pleasant ambience and international range of drinks guarantee your quality entertainment. 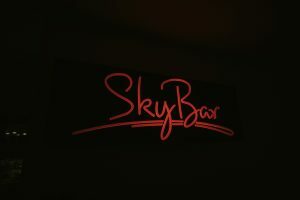 The Sky Bar is in the immediate vicinity of Hungexpo, Budapest, except that it’s fifty meters high above. 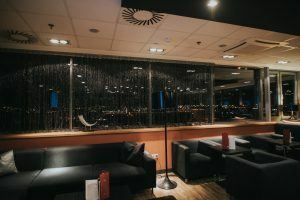 The bar on the top floor of the Expo Congress Hotel is easily accessible by car or public transport. In the hotel parking lot, guests can park their car free of charge. The M2 metro stations are nearby, or you can easily visit us by bus! 1101 Budapest X. district, Expo square 2.